Even if you’ve never visited Thailand, chances are, your tastebuds are probably already familiar with Thai food. Sweet, salty, sour, spicy, bitter – these are the five flavors that are the hallmark of Thai cuisine. When placed upon tastebuds, the flavors balance out in wonderful harmony, one that either leaves many salivating for more, or reaching for a cold drink to put out the fire in their mouths. 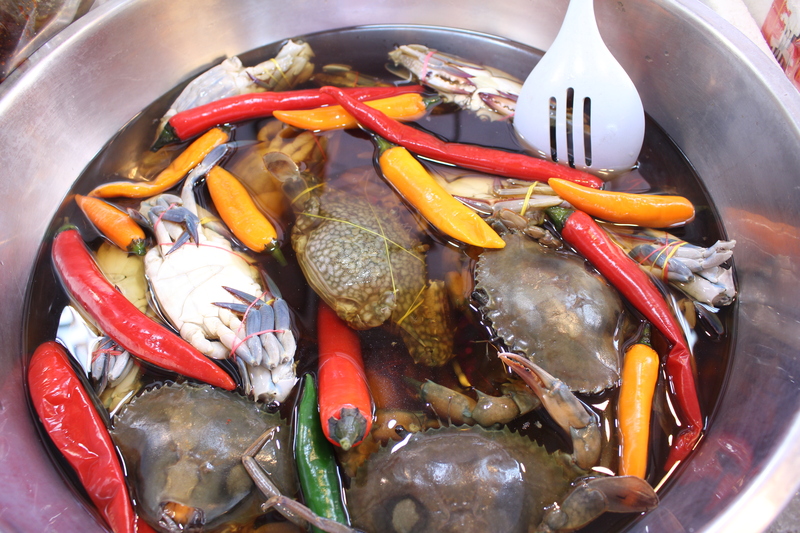 While our first day in Bangkok was spent sightseeing and palace perusing, our second day was devoted purely to satisfying the aching hunger in our bellies as our noses followed tantalizing aromas with the promise of spicy sustenance. There are many options to dine out in Bangkok, and no matter what your budget is – whether it’s fine dining you’re after, or perhaps the hunt for the best street food – you can still experience the full gamut of all that the city has to offer. As budget travelers, Simon and I naturally opted for the latter. 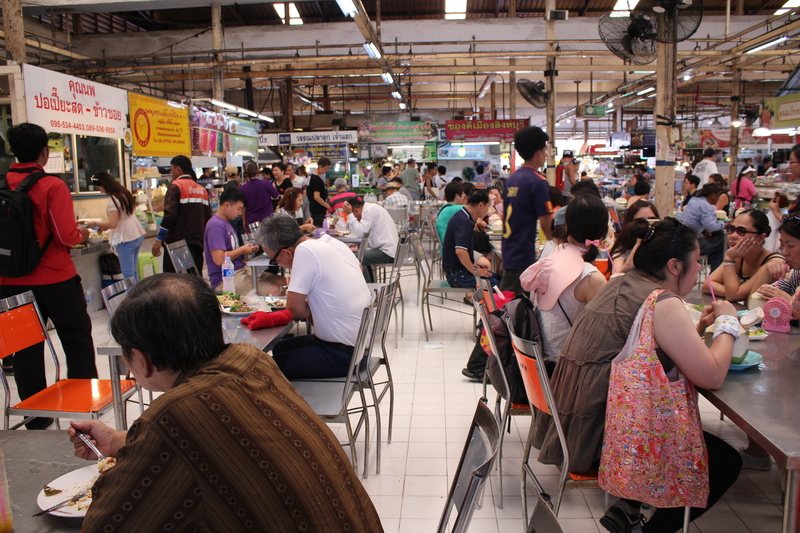 Located conveniently next to the famous Chatuchak Market, the food market of Or Tor Kor makes for a perfect full day of eating to your stomach’s content, followed by walking it off to shop to your heart’s desire. But, since we were living out out of backpacks for the next few months, I painfully bypassed Chatuchak in search for food. Whereas my backpack had a finite amount of space, my belly was a bottomless pit of sorts. Or Tor Kor is not so much a tourist attraction as it is a place for the locals to shop for produce and grab some hot food to go. I tried to play it cool and act like a local as we entered the market, but that was nearly impossible. Beads of sweat were already forming on our foreheads even before we had our first spicy meal of the day. I could hardly contain my excitement as I snapped photos of produce amidst the puzzled looks of the shoppers and sellers alike. It was a colorful visual feast for the eyes and nose. Durian so fresh, the pungent odor filled our nostrils and made my nose hairs curl with aversion. Sacks of dried chili peppers in all shapes and sizes; the sight of them alone made my mouth tingle with heat and eyes burn from the capsaicin in the air. Bundles of garlic piled in high stacks as if to ward off a vampire apocalypse. 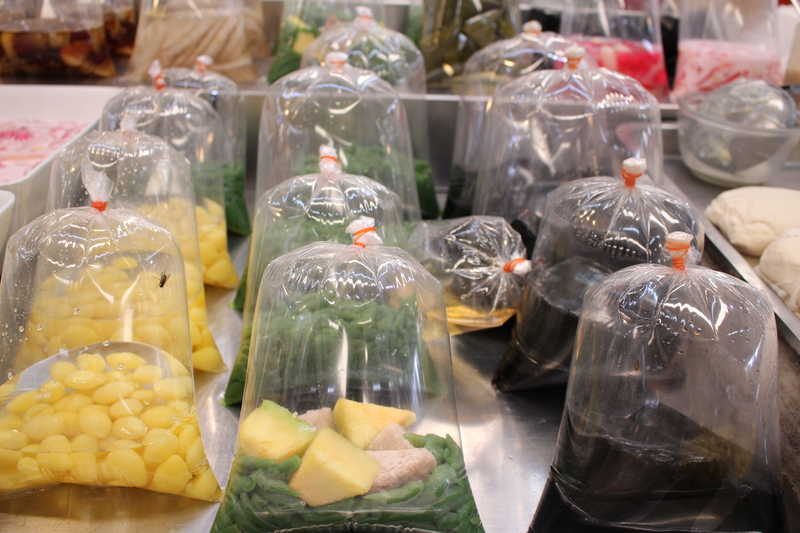 Little baggies resembling air pillows filled with to-go contents of varying kinds, from spicy mixtures to desserts. And of course, this food market wouldn’t be complete without a watchdog to commandeer the tables, making sure seats and tables were cleaned as soon as they were vacated, directing the traffic of hungry people searching for an empty table to set their trays down. This King of Thai, in a regal purple polo tee shirt and donning a heavy necklace of amulets definitely ran the show. Although the selection of food stalls seemed endless, many of them served similar variants of the same dishes. Portions were small, making it easy to sample many plates. We hunkered down to an appetizer of freshly cut and pounded papaya salad, small bowls of savory shrimp noodle soup, and a plate of stir fried minced pork with chili peppers and basil over rice to share. For desert, a cooling bowl of something syrupy with chewy glutinous balls. A double order of thai iced tea cooled us down from the spicy peppers. Meanwhile, the King of Thai raised an eyebrow at watching the latest foreign couple take photos of their food before scarfing it all down in record time.